System of a Down are more interesting than your garden variety nu-metal band. This is the case for two main reasons, firstly they are clearly influenced by the Dead Kennedys in some of the singing style and secondly there is a clear influence of their Armenian roots in the music. System of a Down mesh their Armenian influences with metal in a way which feels much more natural than even Sepultura's mixing of Brazilian rhythms. SoaD are also quite political in their lyrics... at least what you can understand of them. All of this being said the album is still tiring after a while. Fortunately, however, the album is short enough for it not to be too taxing to listen to. So a good album as nu-metal goes... problem is the whole style is kind of crappy. The cover artwork is from a poster designed by the artist John Heartfield for the Communist Party of Germany during the Third Reich. The text in the original poster is: "5 fingers has a hand! With these 5 grab the enemy!". 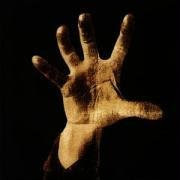 This slogan inspired part of the text contained in the back of the System of a Down album: "The hand has five fingers, capable and powerful, with the ability to destroy as well as create". Later, it is written in bold letters: "Open your eyes, open your mouths, close your hands and make a fist".